Net sales totaled $21,406,939 for the three months ended April 30, 2016, a decrease of $8,856,115, or 29.3%, from $30,263,054 for the three months ended April 30, 2015. The decrease in net sales reflects lower coffee prices during the quarter and our reduced wholesale transactions with Keurig Green Mountain, Inc. of approximately $8,158,000. Cost of sales for the three months ended April 30, 2016 was $18,097,486, or 84.5% of net sales, as compared to $31,340,321, or 103.6% of net sales, for the three months ended April 30, 2015. Cost of sales consists primarily of the cost of green coffee and packaging materials and realized and unrealized gains or losses on hedging activity. The decrease in cost of sales reflects lower commodity prices during the quarter and our reduced wholesale transactions with our largest wholesale green coffee customer. Gross profit for the three months ended April 30, 2016 was $3,309,453, an increase of $4,386,720 from $(1,077,267) for the three months ended April 30, 2015. Gross profit as a percentage of net sales increased to 15.5% for the three months ended April 30, 2016 from (3.6%) for the three months ended April 30, 2015. The increase in gross profits was due to improved margins on our wholesale and roasted business as well as a decrease in our losses quarter to quarter on our hedging operations. Total operating expenses decreased by $116,991 to $1,953,339 for the three months ended April 30, 2016 from $2,070,330 for the three months ended April 30, 2015. The decrease was primarily the result of a decrease of $107,991to $1,789,489 in selling and administrative expenses for the three months ended April 30, 2016 from $1,897,480 for the three months ended April 30, 2015. The Company had net income of $830,801 or $0.14 per share basic and diluted, for the three months ended April 30, 2016 compared to a net loss of $(2,052,560), or $(0.33) per share basic and diluted for the three months ended April 30, 2015. The increase in net income was due primarily to the reasons described above. "We are again pleased to report positive results to our shareholders as we have now successfully achieved four consecutive profitable quarters. Although coffee prices continue to remain at levels where we do on occasion encounter outside competitive pressures, we still improved our profitability in our three key existing business areas. We have increased our efforts in moving away from a focus on commodity type sales of wholesale green coffee to a renewed focus by our green coffee sales team on branding, farm identification, traceability and sales of specialty gourmet micro lots of Arabica coffees, which has helped us sustain and improve our margins during a period of historically low green coffee prices. In addition, sales of our flagship brand, Café Caribe, continue to increase in both existing and new markets, including our anticipated initial roll-out by Wal-Mart at an expected 400 stores later this month as well as an expected additional roll-out by a large regional supermarket chain at an expected 200 stores later this summer," commented Andrew Gordon, the Company's President and Chief Executive Officer. "Additionally, sales of our tea line and both green and roasted coffee sales into China continue to generate limited revenues on a quarterly basis, but we believe that patience with both of these initiatives is important as we continue to develop them on a firm foundation rather than a hurry to market strategy, which we do not believe will be successful in the long run," continued Mr. Gordon. "I know that our stockholders remain disappointed with our current share price but we believe we continue to make strides in the right direction," added Mr. Gordon. "We expect to continue to support our stock through strategic use of our existing buyback program and more importantly through future operating results and the operation of our business over the next several quarters," concluded Mr. Gordon. Coffee Holding Co., Inc. is a leading integrated wholesale coffee roaster and dealer in the United States and one of the few coffee companies that offers a broad array of coffee products across the entire spectrum of consumer tastes, preferences and price points. Coffee Holding has been a family-operated business for three generations and has remained profitable through varying cycles in the coffee industry and the economy. The Company's private label and branded coffee products are sold throughout the United States, Canada and abroad to supermarkets, wholesalers, and individually owned and multi-unit retail customers. Any statements that are not historical facts contained in this release are "forward-looking statements" within the meaning of the Private Securities Litigation Reform Act of 1995, including the Company's outlook on future margin performance and its share repurchase program. Forward-looking statements include statements with respect to our beliefs, plans, objectives, goals, expectations, anticipations, assumptions, estimates, intentions, and future performance, and involve known and unknown risks, uncertainties and other factors, which may be beyond our control, and which may cause our actual results, performance or achievements to be materially different from future results, performance or achievements expressed or implied by such forward-looking statements. All statements other than statements of historical fact are statements that could be forward-looking statements. We have based these forward-looking statements upon information available to management as of the date of this release and management's expectations and projections about certain future events. It is possible that the assumptions made by management for purposes of such statements may not materialize. Such statements may involve risks and uncertainties, including but not limited to those relating to product demand, pricing, market acceptance, hedging activities, the effect of economic conditions, intellectual property rights, the outcome of competitive products, risks in product development, the results of financing efforts, the ability to complete transactions, and other factors discussed from time to time in the Company's Securities and Exchange Commission filings. The Company undertakes no obligation to update or revise any forward-looking statement for events or circumstances after the date on which such statement is made. 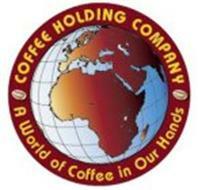 About this company Coffee Holding Co., Inc.